By the time you read this, Derek Jeter may have signed his new contract with the Yankees. Or maybe his agent, Casey Close, is walking up to reporters, flexing Hans and Franz style, then walking away, confident he’s gotten his point across. Or maybe no one has budged at all. No matter the status of the negotiations—and by the end of last week, the Yankees and Jeter were making progress—this will end up the way everyone knew it would all along: Derek Jeter will be a Yankee next year, and the year after, and for the rest of his career. Over the past month, the Jeter Chronicles have provided more entertainment fodder than we could have hoped for, which is why we like sports, after all. The whole situation happened to line up neatly with the Talmudic new-school/old-school debates of the game today: Emotion vs. Statistical Evidence, Loyalty vs. Efficiency, Historical Production vs. Future Results. Were the Yankees stabbing the True Yankee in the back? 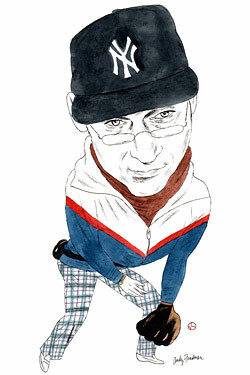 Were Jeter and Close deluded about the marketplace, his skills, and the gray hairs creeping into his receding hairline? Derek Jeter, not for the first time, was a blank slate on which we projected our own beliefs. So allow me to project mine: The Yankees have already been way too nice to Jeter. Their first offer, the one that Jeter and Close appeared to be so confused by, the reported three-year, $45 million proposal, was insane for the exact opposite reasons that Jeter and Close thought it was insane: It’s way, way too much. You can make an argument that, honestly, the Yankees shouldn’t sign him at all. But given a dispassionate assessment of his market value, I’d offer him one year, $5 million … tops. Jeter received the first batch of bad publicity he’s had in, oh, ten years when Jeter’s alleged initial contract demand was leaked to the press last month: six years, $25 million a year. This was a ludicrous number, which Jeter and Close must have known, but the subtext was what mattered: Jeter wanted to be paid what A-Rod is paid, for as long as A-Rod will be paid. The A-Rod-Jeter frenemies story line has gotten so tired that even the media has dropped it, but apparently it was still sticking in Jeter’s craw. It made him look petty and out of touch. The Yankees saw an opportunity in Jeter’s audacity and took advantage of it, beautifully. They didn’t have to do much spinning at all. Compared with Jeter’s outrageous request, their offer looked entirely reasonable. It almost looked kind. It’s strange, though. No one seemed to ask the question of whether $15 million for three years for a 36-year-old declining shortstop is ludicrous in and of itself. No one needed to ask it because the answer is self-evident. Obviously, that’s too much for Jeter, but, you know, it’s Jeter. He’s earned it. Paying for past performance is how teams lose. This is the type of mistake the Yankees have spent the last year avoiding, to their long-term benefit. Let there be no doubt: Derek Jeter as a baseball player isn’t worth close to $15 million a year for three years, never mind $25 million until he’s 42. Last year was the worst season of Jeter’s career by every statistical measure. He posted his worst batting average, slugging percentage, on-base percentage, everything. Of the Yankees’ eight regular position players last season, Jeter was last in OPS, by a wide margin. Of all major-league players with enough plate appearances to qualify, Jeter was 115th in OPS. And this isn’t taking into account his fielding, which may have won him a Gold Glove last year but declined again, further proving the irrelevance of a once-proud award. For years, Jeter defenders have used the “just watch him play every day!” defense for those who criticized Jeter’s numbers. Now that argument can be used against him: Just watching Jeter at short, it’s obvious that his always-limited range is almost completely gone. The Yankees won’t be able to play him there in two years; they probably shouldn’t play him there next year. If Jeter’s name were Alfredo Gonzalez or Hubert Selby, Jeter and Close would be out hunting for no more than a single-year, seven-digit deal. We got a glimpse of Jeter’s inevitable regression, and the way Yankees fans will react to him as he continues to decline, over the final months of the season and in the playoffs. With the rest of the offense clicking, there was a palpable tension every time Jeter came to the plate, a sense that something had changed. (In August, it seemed like he was hitting into double plays even when there was no one on base.) He was, to be frank, the weak link of an offense that was trying to win a World Series. He wasn’t booed, of course, but the murmurings were there: This isn’t the Jeter we once knew. That’s just going to get worse. Fans love Jeter, and they’ll always love Jeter. But they love wins more. And if playing Jeter every day at shortstop as he surpasses a reasonable age for a human being to play that position costs the Yankees wins—and it will—a reckoning is inevitable. Look at what happened with David Ortiz in Boston over the past two years. His sad, months-long slumps became the definitive narrative of an underperforming team. Even when he turned it around and started hitting a bit more, the “What happened to Papi?” questions left a mark. That’s the way it is when the face of your franchise is on his last lap. Yankees fans won’t ever fully turn on Jeter, of course, but what fills seats is not watching a past-his-prime hero trudge around the infield: It’s championships. And playing Derek Jeter at shortstop in 2012 and 2013 makes the Yankees winning a championship less likely. Brian Cashman and the Yankees know this but can’t say it, which is why it’s so strange that they’ve received any criticism for not “taking care of” Jeter. Part of them has to want to say, “Listen, man, you’re lucky we’re offering you this much.” They can’t be so disrespectful to Jeter, but I can: $15 million a year is nuts. Obviously, Jeter is not worthless, on the field or off. He’s not one of the worst players in baseball, not yet, and the Yankees don’t have any obvious replacement brewing in the farm system. And the Yankees brand certainly doesn’t hurt having the Mythical True Yankee still hanging around; you’re going to see JETER 2 jerseys at Yankee Stadium for the next 50 years. The only real milestone he has left is the 3,000-hits plateau, which he’ll surely hit by midseason of next year. After that, there’s nothing within his reach. That’s sort of the point. The Yankees have already paid for that, and their investment has reaped millions in benefits. There is a point when you are throwing bad money after good. And contrary to public perception, the Yankees do have a spending limit, particularly when baseball’s luxury tax is accounted for. Because the Yankees have without fail exceeded the luxry-tax limit—$178 million for 2011—every dollar they spend above that number is essentially $1.40. (Jeter gets a dollar; the Yankees pay $1.40.) The Yankees have already paid $174.1 million into the luxury-tax kitty, and that’s before this year. Paying $15 million for past-their-prime shortstops simply because they “owe it to them” is exactly the type of mistake that the Yankees have been diligent about avoiding. The Yankees’ farm system, which seems to produce cheap, sustainable, cost-controlled talent in perpetuity (save for the shortstop position, if just because with Jeter around, it was never much of a priority), has only improved in recent years, and Cashman, armed with a championship two years ago and a new stadium that is its own cash cow, at last has the public-relations capital to turn the Yankees into the Mega Moneyball franchise he’s always wanted it to be. Yankees teams of the past have failed in part because they were a monolith, an ocean liner being lapped by more lithe motorboats, a stationary army unable to battle the guerrilla fighters coming from all directions. Cashman has succeeded in turning the Yankees into a leaner, more efficient franchise, both on and off the field. Derek Jeter is a relic of a time when the Yankees were paying for names, were paying for what players had once done rather than what they will. Paying him that much above his market value—and considering Jeter has no other suitors, it’s up for debate what that value even is—is precisely what the Yankees have tried to stop doing, for their own well-being. The Yankees are a better team, more likely to win multiple championships, because they’re holding the line on crazy salaries to older players. This is how you win. Jeter will get his money, not as much as he wants but more than he’s worth and enough so both sides will be able to save face and say they “won.” It won’t be crippling to the franchise, not yet. But in 2012, 2013, and, heaven forbid, beyond, it will be. Everybody likes Derek Jeter now, and why wouldn’t they? He’s a Yankees legend. But so is Yogi Berra, and he doesn’t belong behind the plate anymore.